L: Hazed medium golden juice bomb. Thick fluffy white head with outstanding lacing. S: Citrus... citra hops with lemon, tangerine, and grapefruit. Lighter tropicals. T/F: Light grain backbone. Strong citra hop presence leaning towards lemondrops, tangerine, and blood orange. Relatively modest bitterness. Milder tropical notes with some pineapple sneaking in but mostly citrus. Medium bodied... juicy/sticky on the tongue. A bit high on the ABV. O: The problem is entirely me as I just don't like Citra hops enough for it to carry a beer. This is a great brew from Hubbard's Cave (aren't they all) but too much Citra for my taste, and less drinkable for me than their usual. If Citra is your thing you will adore this beer. 16oz can, Canned 100318 Fresh by 120318. Opaque pineapple juice colored ale is capped with a foamy white head. Zesty citrusy hop aroma with passion fruit, grapefruit, and melon coming to mind. Big tart passion fruit & grapefruit flavors with background notes of pineapple, kumquat, and a bit of melon. Fuller body, quite creamy, tart bitterness is moderate. This was good - easy drinking, nice flavors; no complaints from me. Moderate pour yields 1/2 inch egg shell head over a murky body with scant lacing. Nose of citrus and slight tropical fruit. Taste mirrors nose with a strange bitterness which is slightly off putting. Murkiness isn't always a good thing for me, if at all. Okay to good feel and overall, I've had many IPAs like this and still can't recommend any. (I'll have to admit though, that after it warms a bit that nasty bitterness calms down and I upped the taste number from 3.5 to 3.75. L - candied orange evening sunset glow. Big, course bubbles in the head. Fragile. You can see the beer through it like shining a flashlight through your palm. S - heavy dose of sugary hops. Toasted bread and grain. Dark orange and pineapple. T - surprisingly hoppy and grassy, given the aroma. Bright orange candy hops leap out of the glass and assault the back of the mouth with bitterness. Dry, cardboardy earthiness and a tingling lemon. Miled acetone towards the end. Really quite bitter! F - the coarse bubbles are a bit distracting as my lips enter the drink, but those quickly subside. Initial feel is smooth and thick, but after passing the liquid around in my mouth a bit foams it up good. O - it's strong and to the point. A bit too hoppy and the flavors can taste a bit stale, but it's by no means a bad beer. Not the sugary juice bomb I was expecting. Tasted in a Spiegelau IPA glass from a 750 ml bottle on July 14, 2017. Fresh By 01.21.19 tasted in Spiegelau IPA glass from a one pint can on December 9, 2018. This one pours a super murky brown-ish/dark orange color, with a small head, and lots of lacing. This looks incredibly unappetizing, and most likely oxidized to hell. This smells very muddled, with caramel malt, stale hops, pine, and grapefruit. I can tell there's a fairly decent IPA somewhere in here, but this has just turned bad. I normally wouldn't review something like this, but since I'm drinking it before the best by date, I will anyway. Something shouldn't oxidize this badly in the matter of months. This is kind of muddled and flabby, and not all that drinkable. There's a normal level of carbonation. 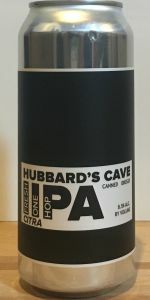 I was excited to try my first beer from Hubbard's Cave, but it's definitely a mess.